Chinstrap penguins (Pygoscelis antarctica) porpoise past iceberg while swimming at Bailey Head on Deception Island in Antarctica’s South Shetlands. Photographed January 8, 2004 using a Canon EOS-1 camera and 600mm f/4 lens on Kodachrome 200 slide film. This entry was posted on Thursday, January 8th, 2004 at 8:05 am. 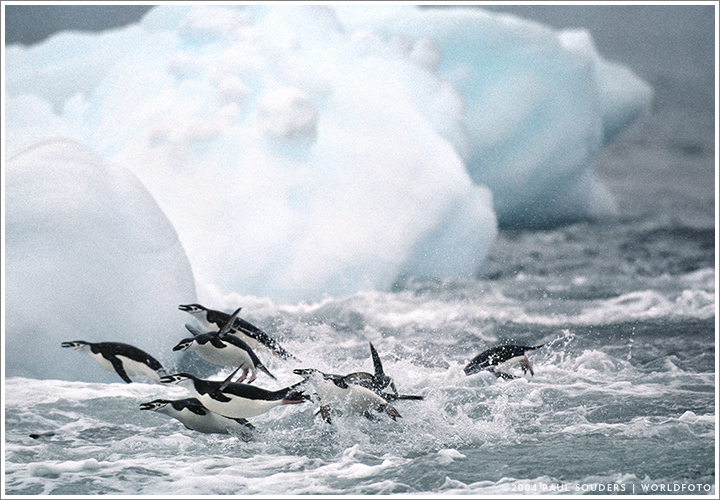 It is filed under On the Road and tagged with Action, Antarctica, Penguins, Wildlife. You can follow any responses to this entry through the RSS 2.0 feed.